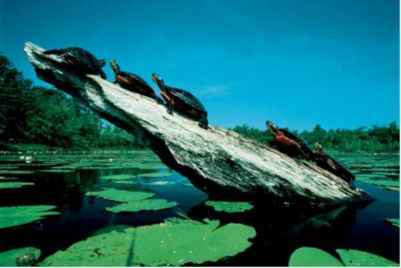 Turtles first appeared in the fossil record during the Tri-assic period, about 220 million years ago. They were originally believed to have evolved from early anapsid reptiles (lanthanosuchids, millerettids, nytiphruretians, pareiasaurs, and the procolophonoids), but recent studies (mostly molecular) argue for a diapsid origin (the group that includes the squamate reptiles, the crocodilians, and the birds). 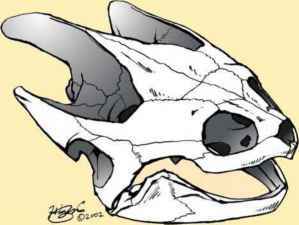 Two mechanisms for retraction of the neck evolved in ancestral turtles. The members of the suborder Pleurodira (or side-necked turtles) retract their necks laterally between the carapace and the plastron, while those in the suborder Cryptodira (or hidden-necked turtles) retract their neck vertically. The pelvic girdle is primitive in shape, and fixed to the plastron in side-necked turtles. 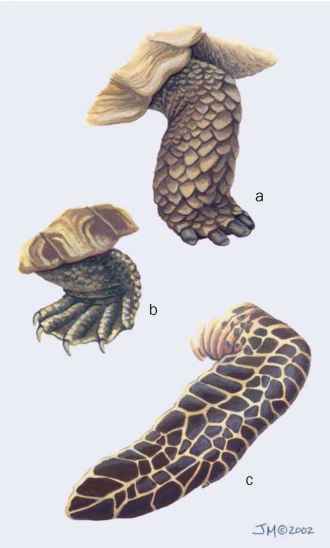 These reptiles are easily recognized by the presence of a dorsal bony carapace and a ventral bony plastron, with the limb girdles located inside the ribs. All living forms lack teeth, have internal fertilization, and lay shelled amniotic eggs. A turtle's shell first and foremost provides protection from predators and serves to buffer harsh environmental conditions. Most species can retract the head and limbs completely within the shell when distressed. The upper shell, known as the carapace, is typically joined to the lower shell or plastron by a bony bridge. the paired hyo- and hypoplastra, epiplastra, xiphiplastra, and a single entoplastron are derived from the pectoral girdle, the sternum, and abdominal ribs (gastralia). The modified shoulder girdle remains inside the ribs, a remarkable arrangement found in no other vertebrate. The outer surface of the shell is generally covered by horny scutes derived from keratin in the epidermal (upper) layer of skin. The scutes overlap the sutures of the bone, which increases the strength of the shell and protects the growing portions. Many variations on the basic shell structure have evolved over time. Softshell turtles, which lack horny scutes, have reduced pleurals, and most have completely lost the peripheral bones. Although softshell turtles lack a bony bridge, the carapace is firmly attached to the plastron by connective tissue. Testudine phylogenetic tree. (Illustration by GGS. Courtesy of Gale. The plastron is greatly reduced, and the bones are loosely connected to one another by cartilage. When fully formed, the plastral bones of an adult softshell turtle may be covered by two to nine leathery callosities, thick callous-like layers of epidermis that cover the plastral bones of softshell turtles. Callosities are generally absent in hatchlings, slowly developing with growth and attaining full size when the seaturtle reaches maturity. An elastic cartilaginous hinge has arisen independently in many lineages. A box turtle can withdraw its head and limbs completely within its shell and draw the anterior and posterior lobes of the plastron tightly against the carapace. Some African tortoises have a carapacial hinge that allows the rear portion to close upon the plastron, thereby protecting the hind limbs. Female semiaquatic and terrestrial species may have a hinge in the posterior lobe of the plastron, providing the flexibility necessary to lay extremely large eggs. in East Africa allows it to squeeze into narrow crevices within its rocky habitat. With the force generated by its legs and the natural elasticity of the shell bones, this tortoise is extremely difficult to extract once it has wedged itself between rocks. What are the differences between a desert tortoise and terrapin? What is difference between tortoises and turtle?